I'm excited to *finally* share with you my collaboration with Matt Blatt. Life has been hectic the last few months...we've just sold our house which was a mammoth task and now we're preparing to move. (Send help!) So while this styling collab was done a few months ago I am only just finalising it now! 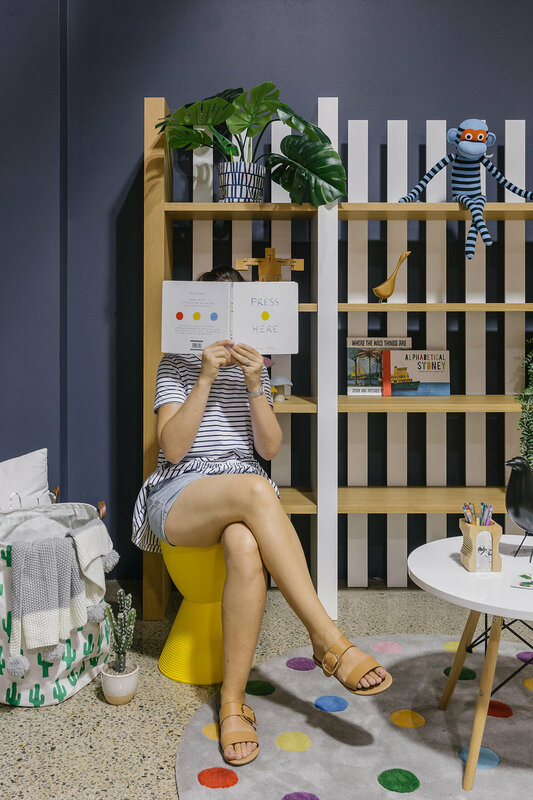 I was super lucky to have free reign in the Matt Blatt Adelaide showroom to show you how to use their products in your own home. So much fun! What I've done is show you how to style three different kids rooms using all Matt Blatt products. I think you'll be pleasantly surprised. I've styled a nursery, a playroom and a boys room. Mama's of boys you have not been forgotten! With each design concept I put a mood board together to pull the look together. As I went through the styling process I didn't use all of the items shown in the concepts...I had the luxury of editing the look as I pulled the rooms together. Styling is about trial and error after all! Starting with the nursery, the rocker caught my eye which I knew would be perfect for a breastfeeding mama, then I built all the other pieces around it. I've kept the key pieces neutral as my base and worked with texture and bold colour to lift the room. I loved the rug and the ottoman and knew this would work well for not only a girl but a boy as well. 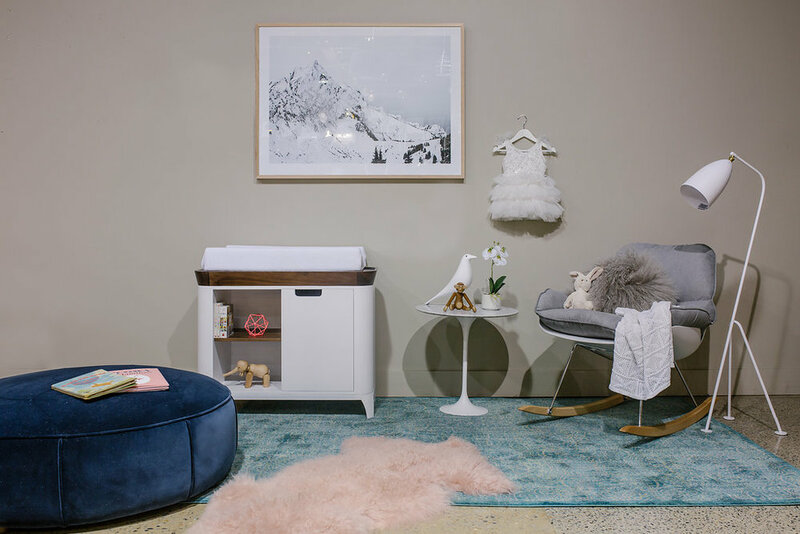 Change up the rug and the ottoman and you have a whole new look when the baby grows out of the baby stage or you want to change the colour scheme. That's the benefit of keeping your furniture pieces neutral, you can change the look as the years and tastes change. This clever dresser is perfect as it can double as storage and a change table. Once the baby is out of nappies you can easily remove the change mat and use the top to display books and toys. It's a piece that will grow with the child, and still looks good. Boys often get neglected when it comes to kids fashion and interiors (that said, it's gotten a whole lot better these last few years mainly due to social media, particularly Instagram) so I wanted to make sure I put a look together for the special boys in our lives. I have a 6 year old boy so it was pretty easy to tap into my knowledge of what would work in a boys room. I wanted to add a sense of fun and adventure with prints and quirky cushions and accessories, as well as heaps of storage. I was really surprised by the furniture options for kids at Matt Blatt. This bed is a winner, and will last them from toddler to teen hood (available in-store, not online, as since I used it here, it's been discontinued. Bummer). The replica Compinibili used as a bedside provides storage to hide books, toys and knick knacks. You could place a lamp or night light on top. Here we've got the hamburger night light mounted on the wall to add a fun and quirky element to the room. The shark storage basket hides all manner of things like cushions, blankets and soft toys. Using the background wall colour as my inspiration I worked with various shades of blue and green in the cushions, bedding, rug and storage basket to bring this look together. What parent wouldn't love a playroom! I know I would. A place for everything, and everything in its place is my motto when it comes to a playroom. A playroom has to be practical, as well as fun. I've used a neutral base with a pop of colour. I love the yellow stool which ties in with the rug. Cushions and blankets bring in texture and books and toys another pop of colour. 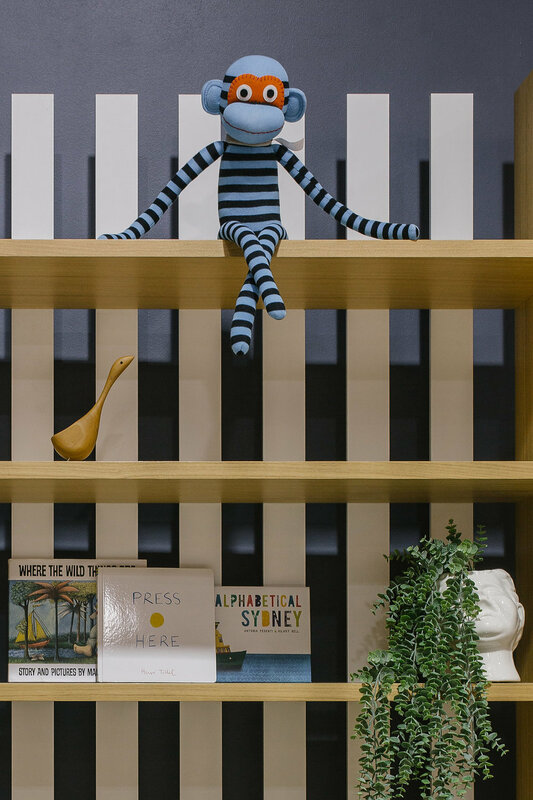 Provide lots of storage to keep the clutter and mess at bay, a table where kids can play and do craft, a big book shelf to host books and small toys, and lots of plants to bring the outdoors in (and the smelly-ness out!). A rug is essential for lego and train track building, and stools and chairs are practical and mean Mum and Dad can hang out here too...just follow my example below! Don't be afraid to use plants in a playroom (or any child's room). You'll need to experiment with the positioning according to how much light the plant needs but most indoor plants just need filtered sun. These ones are fakies, can you tell? Matt Blatt have a wide range of fake plants to choose from. So there you have it, three kids rooms to get you inspired next time you're in a Matt Blatt showroom. I had a lot of fun bringing these looks together. Hope you liked it. Would love to know what you think! A full product list can be found below.